Authentic Designers incepted in the year 1996 are the prominent manufacturer and exporter of hi tech packaging machines across the globe. 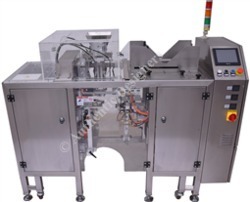 It have been manufacturing a unique range of packaging machines including shrink wrapping machines which is one of its kind in the country. With an extensive experience of this industry we have earned trust, repute and recognition in the field of packaging machines throughout the world. It have made a widespread clientele in food packaging as well as other industries, which need flexible packaging for their products. It operates in the manufacturing/servicing of Slat Chain Conveyor, Vacuum Machine And Sealing Machines, Automatic Sticker / Hologram Labeling Machines Online application for Packaging Machines, Pneumatic Sealer, Rewinder Machine Center Loading since 15 years. Our quality services/products have always won us many appreciations from our clients. Our spontaneous performance and confident approach in offering the excellent range of Slat Chain Conveyor, Vacuum Machine And Sealing Machines, Automatic Sticker / Hologram Labeling Machines Online application for Packaging Machines, Pneumatic Sealer, Rewinder Machine Center Loading, Shrink Wrap Machines that has made us to deepen our roots in the market. We Authentic Designers breathe with the aim to satisfy our clients with our smart products/services. We are a unit of highly experienced professionals who all contribute best of their potentials to offer high efficiency.